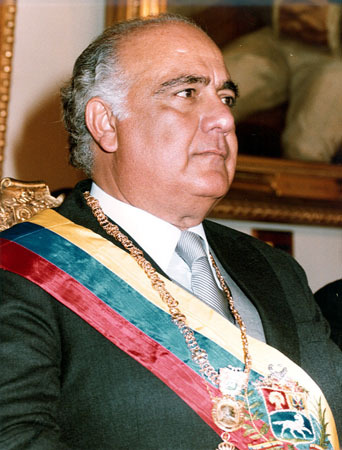 Jaime Lusinchi, whose 1984 to 1989 presidency is remembered as possibly the least competent of the 1936-1999 period, died last night in Caracas. The last of the old-style Acción Democrática populist apparatchiks to run the country, Lusinchi’s ruinous term in office was marked by rampant corruption, a pig-headed refusal to countenance evidently needed reforms, the accumulation of macroeconomic imbalances and the turfing out of large tracts of the public sector to cronies close to the presidential mistress. The economic dysfunction that slowly took over every aspect of Venezuela’s economic life in that time was directly responsible for the social unrest that broke out directly after his period in office, as the incoming administration struggled to deal with the fiscal and administrative mess left behind. A pediatrician by training, Lusinchi played an active role in the clandestine fight against the Pérez Jiménez dictatorship. He was briefly jailed and tortured in the 50s before being sent into exile. Then he settled into a long parliamentary career, including 14 years as leader of AD’s delegation in congress, where he honed his skills as a political wheeler dealer and ultimate party insider. Lusinchi will be remembered as perhaps the only leader of the Punto Fijo era who decisively retired from active politics after handing over power. His relative indifference to the conduct of state affairs after his term arguably mirrored a kind of fecklessness that was visible even while he was in office. Going into self-imposed semi-exile in Costa Rica, Lusinchi quickly sank back into the obscurity he never should have risen from. He was 89.